Stretch mark removal demands the artful and delicate use of our multiple lasers. 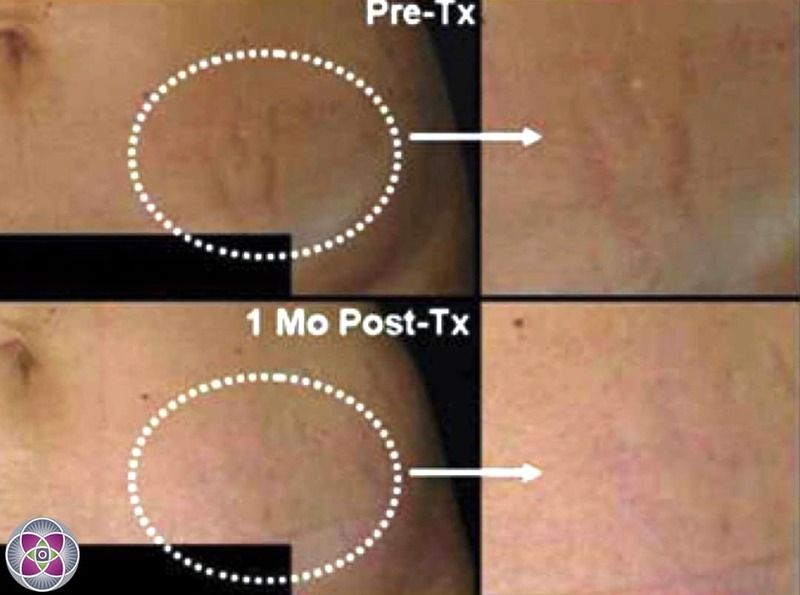 Our multiple modality laser protocol delivers excellent stretch mark removal results for our patients. Watch the video : What is laser stretch mark removal? At AMA Regenerative Medicine & Skincare, we understand how traumatic stretch marks can be, no matter where they are on the body. We also know that many advertised removal treatments don’t deliver on promises, leaving stretch mark sufferers frustrated and disillusioned. Our multiple-modality approach is what makes us capable of delivering the results our patients are seeking. It’s all about our delicate, gradual and above all artful remodeling of the stretch mark to blend with the rest of the skin that makes us stand out among stretch mark removal clinics. Stretch marks are actually scars that appear as depressed streaks in the skin, which are often pink, reddish or purplish. They are most often present on the breasts, upper arms, thighs, buttocks and stomach. They are more common in pregnant women, or those who experience rapid weight gain. Stretch marks should not cause concern as they provide no physical threat and can fade over time. On the other hand, stretch marks all over the body can signal disease conditions such as Cushing’s syndrome or another adrenal gland disease. There are various treatments that can reduce the appearance of stretch marks but these treatments won’t necessarily completely remove them. Stretch marks are caused when the skin stretches beyond its breaking point resulting in thin pink or red lines to manifest. Slowly the elastic collagen layers of the middle layer of the skin where stretch marks occur, called the dermis, will begin to breakdown. This damage causes the dermal tissue to become inflamed and may cause micro bleeding and the formation of scar tissue typical of stretch marks. Consequently, rough, irregular reddish lines begin to form. As the middle layer of skin stretches the epidermis, or exterior layer of skin, it is also forced to stretch and becomes transparent. Eventually the stretch marks from the middle layer of the skin begin to protrude through the outer layer so that the stretch marks are not covered at all by the epidermis. As the inflammation and bleeding heals, scar tissue is formed, leaving a stretch mark. In many cases the red stretch marks will gradually fade to a silvery shade as the scar tissue loses its blood supply. Because pigment-creating cells are found in the epidermis, and because the normal epidermis has split to reveal the underlying stretch mark scar which has no pigment, the resulting silvery stretch marks are lighter than the natural skin tone. 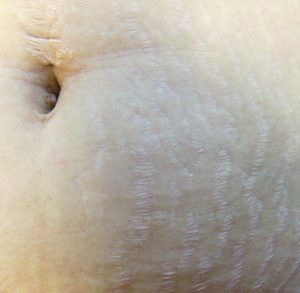 Stretch marks are all very different and complicated to treat. That’s why we customize each individual laser stretch mark removal treatment to each patient’s specific needs. A typical treatment protocol to remove stretch marks usually includes 3-4 different lasers per session, as well as a variety of non-laser modalities such as Collagen Induction Therapy (CIT) with Physiological Regulating Medicine (PRM) formulations, and hyperbaric oxygen treatments. First, every stretch mark is individually targeted with the laser. Next, we administer a color blending laser treatment causing the “turn-over” of excess melanin that may be held in the stretch mark. This evens out coloration, blending it with the surrounding skin. Some stretch marks are red because of excess vascularization. Using a different laser technology, we target this micro-vasculature, to make the redness go away. Lastly, we stimulate the production of new collagen with an intense collagen treatment to fill in the stretch mark from the inside out. This treatment targets old deteriorated collagen fibers deep in the dermis that are beyond repair in order to accelerate its removal through your body’s own natural processes. Other less damaged collagen will be remodeled into new and younger collagen. We also target fibroblast cells throughout the dermis, stimulating them to produce amplified quantities of new, young and healthy collagen. This process requires 2-3 different lasers. The final part of the laser stretch mark removal treatment smoothes out the surface of the scar with an epidermal resurfacing laser (a laser peel). This phase removes a precise portion of the upper layers of the epidermis (the dead cells on the top layer), along with its imperfections, discolorations, fine wrinkles and roughness. Physiological scars, such as acne scarring and stretch marks. As a prerequisite, it is important for patients to understand that all stretch marks are unique, and each is an anomaly. Thus, not only do treatment outcomes vary from patient to patient, but even on the same patient, two stretch marks just a few inches away from each other can be very different, and will treat differently as they go through stages of remodeling and healing. The entire process is natural, wherein we stimulate the regenerative mechanisms inherent in a patient’s skin and then allow time for the skin to heal, remodel the stretch marks and generate new tissue. During this process we carefully observe how the skin responds, and continuously customize the protocol to achieve the maximal regeneration that the skin is capable of. The stretch marks often look worse after each treatment before they heal and look better. They are likely to be red and swollen, and in some skin types, temporary pigmentation called “post inflammatory hyperpigmentation” is common, which can be minimized with special creams and resolved after the physical stretch marks have been treated. With each phase, the stretch marks progressively blend back into the surrounding skin becoming less and less noticeable. To make all this happen, we customize Integrative Protocols, wherein we utilize over twenty different high-tech medical lasers, PRP, micro-needling, specialized homeopathic injections, subcision, (subcutaneous incisional surgery) and even stem cells. While some stretch marks resolve quickly, in as few as 3 laser treatments, the process may take considerably longer…. from 3 to 5 to 8 treatment sessions. Accordingly, we charge by time necessary to complete each treatment session, and patients pay-as-they-go, because we never can tell just how fast a patient’s stretch marks will heal! In general, Aesthetic medical procedures follow the well known “bell curve” graph that is typical of most biological systems. 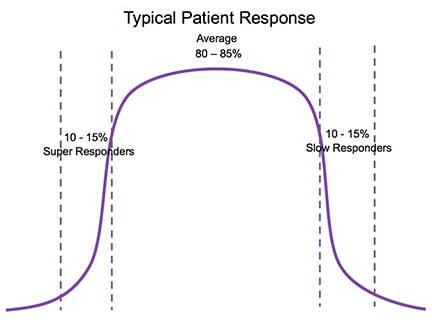 That vast majority of patients ~80% fall into the “average” category, ~10% are “slow responders” wherein they may require more treatments than the average patient, and ~10% are “super responders”, who achieve their desired results faster and with fewer laser treatments than the average. Q. Which laser do you use for your stretch mark removal treatments? A. We have over two dozen different lasers and we are experts in using all of them. From this wide array of different technologies, we will pick the lasers that are best suited for your specific skin and for the stretch marks we will be treating. The likely choices are: NdYag, Fractionated RF, Erbium, and possibly a Sciton glass erbium. The stretch mark removal treatments will be customized to your specific skin. Q. How much does this treatment cost? A. With the exception of hair removal, where the prices are the same for almost everyone, all of our other laser treatments are customized for each patient. 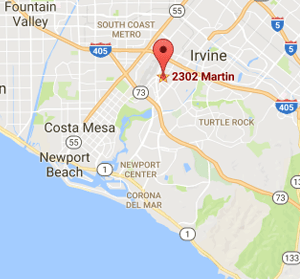 That way each patient gets the most efficient and effective laser treatment to achieve the results they want. Because of this, the cost of each laser treatment depends on what each patient needs. 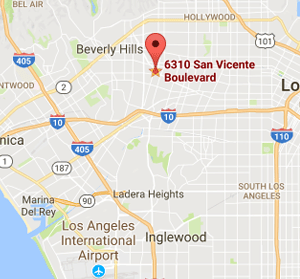 To keep it simple and fair for all of our patients, we charge by time, in 15 minute segments. In this way, a patient does not have to pay extra if we use many different lasers during the treatment. Q. Does the laser treatment hurt? A. A topical numbing cream is applied prior to the laser treatment. Virtually all of our patients report that though the sensation may be uncomfortable (if at all) the treatment is completely tolerable. Q. What is the best way to keep from getting stretch marks? A. Even daily use of creams or lotions will not prevent stretch marks. The best way to reduce the possibility of getting stretch marks is to stay at a healthy weight. Women who are pregnant should work with a doctor to minimize stretch marks. Lots of weight gained, in a relative short period of time, will boost the chances of getting stretch marks. Q. How safe are the treatments? A. Laser stretch mark removal treatments provided by AMA Regenerative Medicine & Skincare are known to be very safe, with virtually no “downtime” and almost no risk of any permanent unwanted side effects. Q. Does this stretch mark laser work on black skin? A. Our laser protocols are customized for each person according to what their skin needs. Stretch marks can vary tremendously from person to person. Therefore, what ever kind of skin a person may have, from albino to alabaster black, a laser protocol for their specific skin can be customized to achieve the best possible results. For information regarding the challenges, truths and misconceptions of treating darker skin types with lasers, visit the Darker Skin FAQ page.